The City of Springfield has been awarded $21.8 Million Community Development Block Grant DisasterRelief funds (CDBG-DR) that will be used for disaster related relief, long-term recovery, restoration of infrastructure and housing and economic revitalization activities in the most impacted distressed areas of the City of Springfield resulting from multiple Presidentially Declared Disasters occurring in 2011 or 2012. 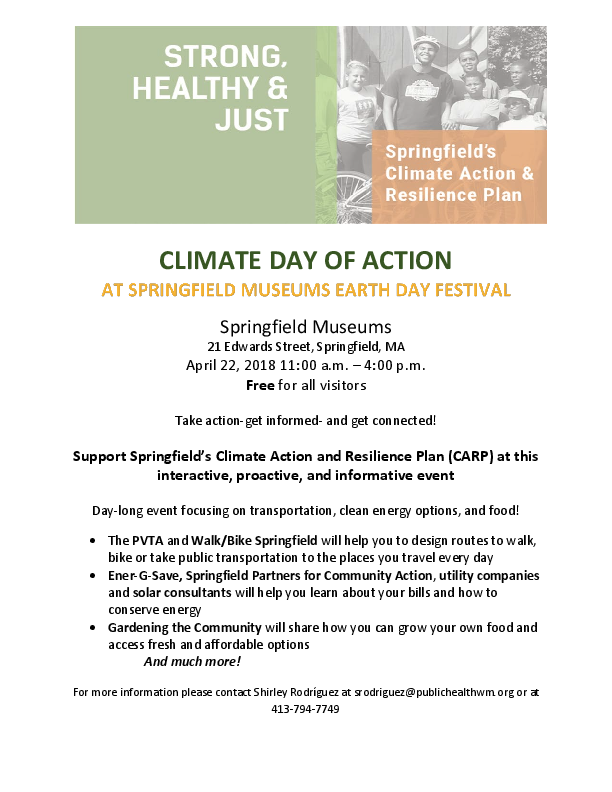 The City of Springfield in partnership with the Pioneer Valley Planning Commission will be supporting Springfield's Climate Action and Resilience Plan (CARP) and participating in the Earth Day Festival at the Springfield Museums on April 22, 2018 from 11am - 4pm. This will be an opportunity for residents to become engaged in Springfield's resilience process during a day long event focused on transportation, green initiatives and food! For more information please view the flyer here. The City has partnered with the Pioneer Valley Planning Commission to launch www.resilientspringfield.org. A new website that tracks the City's Climate Change and Resilience Plan and the various ways in which Springfield is becoming a more resilient City of the future. We encourage all residents to regularly visit to view exciting new updates and tips. Recruitment for the Regional Employment Board's CDBG-NDR funded Construction Skills Training Program is currently underway. The session will begin at the end of February 2018. Interested applicants should contact (413) 858-2800. Click here to view informational flyer. The City of Springfield has released a DRAFT Amendment to its' CDBG-NDR Phase II Application/Action Plan. You may click here to view the City's Amendment to the CDBG-NDR Phase II Application/Action Plan. This amendment will expand the geographical eligibility criteria for participants in the IT Workforce Training Program, Healthy Homes/Construction Workforce Training Program, Citizen Science Initiative and the Citizen Tree Stewart Program. A public hearing regarding this amendment will be held at 36 Court Street, City Hall, Room 310 on January 31, 2018 at 4:00 p.m. Interested parties may provide comments and input at the public hearing on January 31, 2018 or written comments may be mailed or delivered to the Office of Disaster Recovery, Attn: Tina Quagliato, 36 Court Street, Room 405, Springfield, MA 01103. Comments may also be submitted via email to tquagliato@springfieldcityhall.com. Comments must be submitted no later than February 13, 2018. Esta Enmienda al Plan de Acción expandirá el criterio de elegibilidad geográfica para participantes en el Programa de Entrenamiento de Fuerza Laboral IT, el Programa de Hogares Saludables/Entrenamiento de Fuera Laboral de Construcción, Iniciativa de Ciecia Ciudadano y el Programa de Guardianes Diudadadanos de Árboles. La Cuidad de Springfield esta en busca de aportación sobra la Enmienda PRELIMINAR. La Enmienda PRELIMINAR al plan estará disponible por un period de comento de quince días comendando el 29 de enero del 2018 and terminado el 13 de febrero del 2018. Una audiencia pública se llevará a cabo sobre esta enmienda en la 36 de la Calle Court, en la Alcadía, Sálon 310 en el 31 de enero del 018 a las 4:00 p.m.
Personas interesadas pueden proveer comentarios en la audiencia pública que se llevara a cabo el 31 de enero del 2018 o comentarios por escrito por correo o entregados a la Oficina de Recuperación de Desastres, Attn: Tina Quagliato, 36 Court Street, Room 405, Springfield, MA 01103 por correo electrónico a tquagliato@springfieldcityhall.com Sumisiones Deben ser recibias no más tarde del 13 febrero del 2018. The City has submitted to HUD it's one-for-one replacement plan for the Marble Street Apartments at 111-117 Marble Street and 112-118 Marble Street. It is being posted on the DR site for public viewing. For questions regarding this plan, including to obtain a copy in Spanish, you may contact tquagliato@springfieldcityhall.com. To view the One-for-One Replacement Plan, click here. The City is making $175,000 in CDBG-DR funding available for proposals from property owners and/or developers for "ready to proceed" historic renovation projects. The property must be located within the Maple Hill, Ridgewood and/or Lower Maple Historic Districts. The property must have sustained damage as a result of the June 1, 2011 tornado and must continue to have unrepaired exterior damages, as a result of the tornado that are detrimental to public health and safety. Applicant must be able to document this and sign an affidavit to this effect. Property owner must not have received duplicative benefits from another sources/s (Insurance, FEMA, SBA, etc) for the repairs applied for under this program. City of Springfield and State property taxes, fees, fines and municipal liens must be current. Applicants must be able to demonstrate site control for all proposed projects. Projects should be "ready to proceed" immediately, or within thirty days of the award. All repairs funded under this program must be completed and expenses paid out no later than October 31, 2016. All projects must meet the HUD Elimination of Slums and Blight, on a Spot Basis National Objective, therefore only exterior repairs that address code enforcement violations and/or public health and safety concerns will be eligible for funding under this program. All questions regarding bid or its specifications must be received by the Office of Procurement by close of business on October 25, 2017 and should be submitted in writing to lstabilo@springfieldcityhall.com and tquagliato@springfieldcityhall.com. Proposals will be received by the Office of Procurement, 36 Court Street, Room 307, Springfield, MA until 2:00 PM on November 15, 2017. (NOTE THIS DATE HAS BEEN EXTENDED) Additional information available of the Office of Procurement website or view Mayor Sarno's Press Release. The Regional Employment Board has launched the Construction Skills Training program. The program is being held at Putnam Vocation School and is in partnership with the City of Springfield, U.S. Department of Housing and Urban Development and is being funded through the National Disaster Resilience Competition. 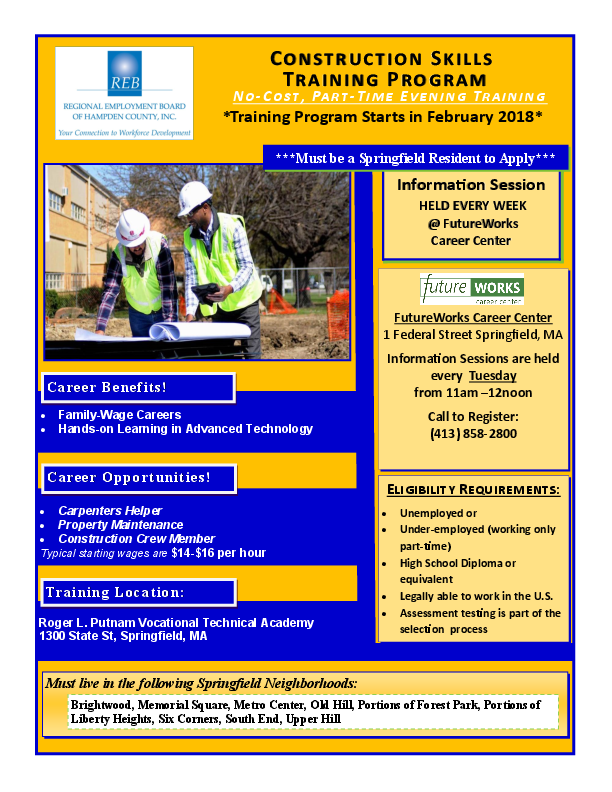 The training will give income qualified Springfield residents, enrolled in the training a variety of construction skills education that will allow them to obtain employment in the construction trades. The City has partnered with Tech Foundry to provide an IT Job Training program to income qualified, Springfield residents of the Urban Watershed District. The program partners with area employers to train students for positions in the local area. Two full sessions have been completed and the third session is currently underway. Mayor Domenic J. Sarno, the Pioneer Valley Planning Commission, Partners for a Healthier Community, and the Harold Grinspoon Foundation announce the City’s launch of its ambitious Strong, Healthy, and Just Climate Action and Resilience Plan, and its partnership with the ‘ener-G-save’ initiative to urge homeowners to take advantage of free home energy audits, incentives and financial assistance to make their homes more energy-efficient. The announcement will take place on Wednesday, September 6, 2017 at 2:15 in City Hall, Room 220. Funded by the U.S. Department of Housing and Urban Development’s disaster resilience grant to the City, the recently-completed Climate Action and Resilience Plan provides the blueprint for the City of Springfield to reduce greenhouse gas emissions by 80% by 2050 and to enhance the City’s overall resilience. City government has already substantially reduced municipal energy use; has been certified in the first round of Massachusetts Green Communities; and has advanced policy like the Complete Streets Resolution, which prioritizes safe walking and biking. The City will use the Plan’s guidance to take its next steps toward further resilience. Meeting the ambitious goal of an 80% reduction will require government, business and residents to work together. During the launch, we are pointing out that residential buildings make up just under a third of Springfield’s overall greenhouse gas emissions--384,105 metric tons of CO2e—so homeowners have an important role in learning about and addressing energy efficiency in their homes. Springfield is excited to have ‘ener-G-save’ as an implementation partner to help with the issue of home energy efficiency. 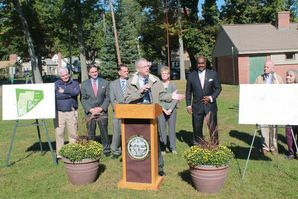 Springfield is one of ten cities and towns chosen to participate in this project supported by Harold Grinspoon Charitable Foundation Energy LLC. This past winter, thermal images were taken of over 6,500 single family homes in Springfield, and these images are being mailed to homeowners this week to indicate places in the home where heat is leaking out of walls and roofs, and where money and energy are being wasted. Be sure to watch your mail for a white window envelope from ‘ener-G-save’ in the next week or so to see if YOU will receive the image. Whether or not you get one of these reports, you can be an early adopter in your home. The Mayor's Office urges all homeowners to call the hotline (413)-279-9141 or sign up at the web link here: www.ener-g-save.com/form and line up a free energy audit that will help you learn how to make your home healthier and more comfortable, all while saving money and energy. Whatever your income, you will be directed to services that will help you learn what financial assistance is available to you, what can be done for free, and who can help you do the work. One contact with ‘ener-G-save’ and you'll be on your way to helping the Climate Action and Resilience Plan get off to a running start by increasing our energy efficiency as a City. Springfield will be tracking our progress toward meeting our goals on a new website: www.ResilientSpringfield.org, where you can see details about the actions City departments are implementing and what steps you can take as residents and business owners. Click here to view the Climate Action and Resilience Plan. The City of Springfield has launched a new Healthy Homes Program (HHP) funded by the U.S. Department of Housing and Urban Development with National Disaster Resilience Competition funds (CDBG-NDR). The program makes federal housing rehabilitation funds available to owners of 1-4 unit residential properties in the Memorial Square and Six Corners neighborhoods. The program is available for both owner-occupied and rental units. HHP provides funds for home rehabilitation, abatement of lead, removal of asthma triggers, and improvement of energy efficiency. It is an integrated, whole-house approach that produces sustainable, green, healthy and safe homes. For additional information visit the website or contact the Office of Housing at (413)787-6500. HUD has provided CDBG-NDR funding to allow for the City of Springfield and the Pioneer Valley Planning Commission to partner on the creation of a Climate Action and Resilience Plan (CARP) in order to make Springfield more resilient in the face of more frequent and severe weather events. This document is being posted for public review through June 29, 2017. Comments regarding the Climate Action and Resilience Plan may be submitted to cratte@pvpc.org through June 29, 2017. To view the document, please click here. The City has a goal to reduce its' overall energy use and carbon footprint over the next four years. The City realizes that reaching this goal is only by possible by encouraging institutional resilience in its' businesses and especially in large anchor institutions like Baystate. As a result of this, the City of Springfield, Baystate Medical Center, the Commonwealth of Massachusetts Department of Energy Resources and HUD have teamed up to fund the construction of a Combined Heating and Power Co-generation (CHP) facility on the Baystate Medical Center Campus. The installation of the CHP Plant will allow Baystate Medical Center to operate for a minimum of thirty (30) days uninterrupted during a utility crisis. The new CHP plant will produce 80% of Baystate Health's annual energy consumption. The CHP Plant will produce 68% of the electricity and 97% of the steam utilized at Baystate. The project will reduce annual utility costs by a minimum of $1.45 million dollars and will provide an annual reduction of greenhouse gasses by 13,513 tons. Construction of the CHP is underway and progress is being made steadily. The City and Baystate anticipate having the CHP fully commissioned by early 2018. On May 12, 2017, the City and the Pioneer Valley Planning Commission hosted a stakeholder engagement workshop at the La Quinta Hotel in downtown Springfield. This workshop was one of several sessions held as part of the development of the Climate Action & Resilience Plan. The workshop included representatives of various City Departments including Housing, DPW, Disaster Recovery, Planning, Economic Development, Health and Human Services, Parks and Facilities Management. The workshop was also attended by representatives of the Springfield Water and Sewer Commission, Eversource, DevelopSpringfield, Springfield Climate Justice Coalition, Regreen Springfield, Partners for a Healthier Community and PVTA. Below is a link to review Substantial Amendment #3 to the City's CDBG-DR Partial Action Plan A. If you would like more information on the Action Plan A - Substantial Amendment #3 please contact Julisa Davila-Ramos by calling 413-886-5197 or by email at jdavila-ramos@springfieldcityhall.com. Para informacion adicional sobre el Plan de Acción Parcial A – Enmienda Sustancial favor de ponserse en contacto con Julisa Davila-Ramos al 413-886-5197 o por correco electronico al jdavila-ramos@springfieldcityhall.com. The City has partnered with the Pioneer Valley Planning Commission to create the Springfield Climate Action and Resilience Plan (CARP). As part of the public input process the City and PVPC held multiple public sessions throughout the City to solicit public input and feedback for the plan. You can view photos from the Mason Square Session. For more information regarding the Climate Action and Resilience Plan or on the public sessions you may contact Catherine Ratte at the Pioneer Valley Planning Commission at 413-285-1174 or email cratte@pvpc.org. The City of Springfield, in partnership with Pioneer Valley Planning Commission, Arise Springfield and Partners for a Healthier Community, have announced a schedule of public meetings regarding the Springfield Climate Action and Resilience Plan. Please click here to view the flier. To view the flier in Spanish please click here. 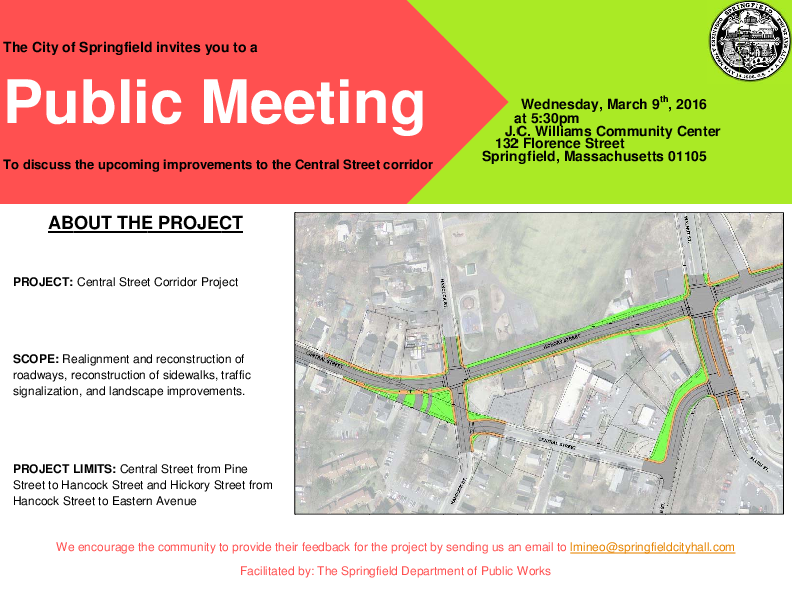 The City of Springfield has scheduled a public meeting to discuss upcoming improvement to the Central Street corridor. The meeting will be held on Wednesday, March 9, 2016 at 5:30 p.m. at the J.C. Williams Community Center, 132 Florence Street, Springfield. The public is encouraged to provide their feedback for the project by sending emails to lmineo@springfieldcityhall.com. To view this announcement in Spanish, please click here. Below is link to review the Combined Notice of Finding of No Significant Impact and Notice of Intent to Request Releases of Funds. Click here to review the notice. City Releases Substantial Amendment #2 to Partial Action Plan A. Below is a link to review Substantial Amendment #2 to the City's CDBG-DR Partial Action Plan A. Please contact the Office of Disaster Recovery and Compliance at 413-750-2114 or TTY 787-6641 for additional information. Below are links to review Substantial Amendment #1 to the City's CDBG-DR Partial Action Plan A. Congressman Neal and HUD officials joined Mayor Sarno and City officials on a tour of the tornado damaged areas on the fourth anniversary of the June 1, 2011 tornado. 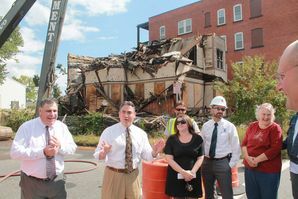 On May 21, 2015 Mayor Domenic Sarno and City Officials praised the demolition of the tornado/fire damaged and long blighted building at 158-162 Rifle Street f/k/a Lincoln Hall. The property was demolished with CDBG-DR funds and pursuant to a Court Order issued by the Western Division Housing Court. Mayor Domenic J. Sarno has announced the City of Springfield's new home repair program to assist homeowners who continue to have unrepaired damage to their primary residence as a result of the June 1, 2011 tornado. Have sustained substantial, severe or major damage from the June 2011 tornado. Homeowner must be able to document current unrepaired damage fromt the tornado that has not been reimbursed by insurance, FEMA or SBA. Home must be located in one of the five most impacted neighborhoods: South End, Six Corners, Old Hill, Sixteen Acres and East Forest Park. Home must have served as the homeowner's primary residence at the time of the disaster and must currently be their primary place of residence. Homeowner must meet income eligbility guidelines. Homeowner must have registered with FEMA following the tornado. Homeowners who are interested in additional information should contact the Office of Disaster Recovery at (413)784-4883 or the Office of Housing at (413)787-6500. Applications can be picked up in person at the Office of Housing, 1600 East Columbus Avenue or can be obtained via email from spham@springfieldcityhall.com. The City of Springfield has funded three organizations to provide job training to residents of disaster impacted neighborhoods, specifically the South End and Six Corners. Springfield Technical Community College has begun enrollment of residents of the Disaster Impacted Six Corners and South End neighborhoods for Workforce Training programs that are being funded by the CDBG-DR Program. Acceptance will depend upon a series of assessments measuring math, reading and writing skills. Those interested in enrollment or additional information should contact Ana Sanchez at (413) 755-4789 or aisanchez@stcc.edu. Click here to read the article from The Republican/Masslive. In response to guidance from HUD the City has updated the CDBG-DR Policies and Procedures Manual. To view a copy of this manual you may click here. The City will be awarding a total of $250,000 in CDBG-DR funding to three organizations to provide job training and workforce developmnt programs to residents of disaster impacted neighborhoods. There will be a special focus on recruiting residents of the Six Corners and South End neighborhoods, as the residents of these neighborhoods face multiple barriers to employment and both areas were heavily impacted by both the long and short term effects of the natural disasters that occured in 2011. The City anticipates that the contracted organizations will provide training to a minimum of 100 Springfield residents. 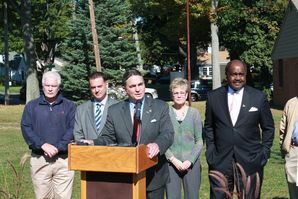 Mayor Sarno and Congressman Richard E. Neal have announced a $750,000 renovation to Nathan Bill Park in East Forest Park. Nathan Bill Park and the East Forest Park neighborhood were directly impacted by the June 1, 2011 tornado. The renovation is being funded with a CDBG-DR grant from the U.S. Department of Housing and Urban Development. 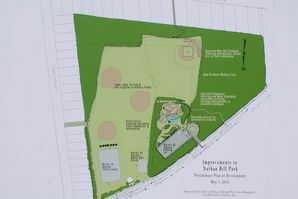 The City, in conjunction with the East Forest Park Civic Association and area residents, developed a master plan for Nathan Bill Park. Improvements will include new tennis courts, improved athletic fields, improvements to the existing playground and swings, a new splash pad, landscape improvements and improved parking. The project is out for public bid and construction will be completed by fall 2015. 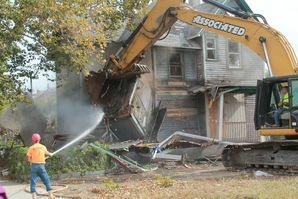 The City announced the demolition of several buildings included within the second phase of CDBG-DR demolitions. The demolitions being completed by Associated Building Wreckers of Springfield at 17 Adams Street and 19 Pine Street Court. Both properties we impacted by the disaster, remain blighted and are located within disaster impacted neighborhoods. The demolition of the properties continues paving the way for redevelopment of the disaster impacted neighborhoods. 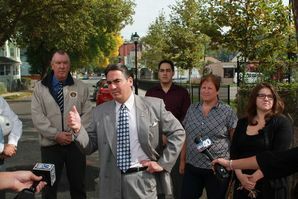 Mayor Domenic J. Sarno and City of Springfield Officials appeared at 187 Pine Street in the Six Corners neighborhood to announce the beginning of the first phase of CDBG-DR Demolitions. "The demolition of these buildings are a priority of our residents and is another part of the concentrated efforts to eliminate blight in our neighborhoods," stated Mayor Domenic J. Sarno. Two buildings, 43 Stebbins Street and 259 Eastern Avenue, are City owned, tax foreclosed, properties that have been eyesores for several years. 187 Pine Street is a privately owned, court ordered, demolition and is near the on-going redevelopment on Central Street. Asbestos abatement for 187 Pine Street and 259 Eastern Avenue has been completed by AccuTech Insulation & Contracting, Inc., of Ludlow and demolition will be completed by Arment Trucking, Inc., of Springfield. Asbestos abatement and demolition for 43 Stebbins Street is being performed by Associated Building Wreckers of Springfield. Environmental oversight of the projects is being performed by Cardno/ATC of West Springfield. 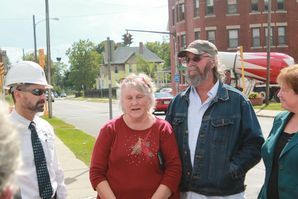 Read the article from The Republican/Masslive. PROJECT SUMMARY: Federal funds will be used for predevelopment and/or gap funding to developers of replacement multifamily affordable housing. Magazine Commons will replace the Mental Health Association?s former Union Street apartments with a newly developed complex on Magazine Street as a result of damages incurred from the June 1, 2011 tornado. All projects will take place in the City of Springfield, Hampden County, Massachusetts. There was no determination of Categorical Exclusion and therefore an Environmental Assessment (EA) has been completed. The City of Springfield has determined that the Magazine Commons Project will have No Significant Impact on the human environment. Therefore, an Environmental Impact Statement under the National Environmental Policy Act of 1996 (NEPA) is not required. Additional project information is contained in the Environmental Review Record (ERR) on file at the Office of Disaster Recovery and Compliance located at the address above and may be examined or copied weekdays from 8:15AM to 4:30PM. Any individual, group, or agency may submit written comments on the ERR to the Office of Planning & Economic Development at 70 Tapley Street, Springfield, MA 01104. The City of Springfield will consider all comments received on or before August 31, 2014 prior to authorizing submission of requests for release of funds. The City of Springfield certifies to HUD that Domenic J. Sarno, in his capacity as Mayor, consents to accept the jurisdiction of the Federal Courts if an action is brought to enforce responsibilities in relation to the environmental review process and that these responsibilities have been satisfied. HUD's approval of the certification satisfies its responsibilities under NEPA and related laws and authorities and allows the activities listed above to use Program funds. Objections must be prepared and submitted in accordance with the required procedures (24 CFR Part 58) and shall be addressed to U.S. Department of HUD, Office of Community Planning and Development, Thomas P. O?Neil Jr. Federal Building, 10 Causeway Street, Boston MA 02222. Potential objectors should contact HUD to verify the actual last day of the objection period. The City of Springfield is making available for public viewing the Performance and Expenditure projections under approved Partial Action Plan A. Click this link to view this document in its entirety. The City will hold three community planning meetings to obtain input from residents about the needs and priorities of the most impacted distressed areas and see how these funds should be allocated for disaster related relief resulting from multiple Presidentially Declared Disasters of 2011 and 2012. For additional information or need further assistance please contact the Office of Community Development (OCD) at 413-750-2241. If you were unable to attend and would like to submit a comment, please use the form below.